South Florida lost a pioneer when John Collins passed away on February 11, 1928. 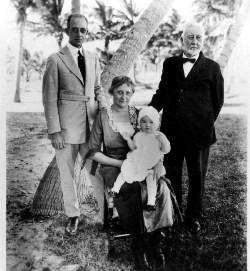 Along with Carl Fisher and the Lummus Brothers, Collins was a founder and developer of Miami Beach. He was a farmer, horticulturalist and innovator. While many people saw a desolate land mass, Collins saw opportunity for farming and was later convinced to develop his portion of the island as a tourist resort. His partnership with Fisher helped Collins complete his bridge which later led to the development of the area that was later dubbed “America’s Playground” in the mid-nineteen teens and early 1920s. John Collins accomplished a lot for a man who began his Miami Beach endeavors after the age of 70. Collins Avenue and Collins Canal are named for him. He was 90 years of age when he passed away.